Pharoah, by DayStar West Media. Editor’s Note: The following was originally posted on Tracy Hickman’s Bronze Canticles boards. Unscribe: I thought I would build on the topic begun by Falconer on the previous post. This will be very specifically directed to the earliest enterprise of the Hickmans…DayStar West. I once read a quote of Harold Johnson on his interview of Tracy Hickman for a staff position at TSR. HJ mentions seeing Eye of the Dragon along with Pharaoh as some of the DayStar West items he looked at. This immediately made me think of Dragonlance as well. I read somewhere else that Tracy planted the original creative seed for the need of TSR to develop an adventure based specifically around a dragon. This was essentially how creative development headed toward Dragonlance. Do I have this correct? Another interesting item from DayStar West is Vampyr. How far into development did this make it? In my opinion, TSR really did itself a favor hiring on the Hickmans. The quality of DayStar West adventures is heads and shoulders above that of other independent non-TSR publishers from the late 70’s early 80’s. Tracy Hickman: Wow, there is so much to tell… and I want to preface all of with my acknowledgment that what I say may or may not be true. It is true the way I remember it but all memory is a matter of perception. Other people may remember these events differently than I do; that does not make them wrong — it only means that they remember it from their own perspective. What you’ll get from me is my perspective and I’ll represent that as honestly as I can. DayStar West was the DBA that Laura and I used to self publish adventures in the late 70’s and early 80’s. As newlyweds, we had a lot of dreams back then and I had perhaps more than a healthy share of ambition. Laura had introduced me to D&D (another story for another time) but our money was tight as I was in college at the time. Laura said that if we were going to spend money on the AD&D Dungeon Master’s Guide — the original, first edition that had just come out — then we needed to find a way to make money at it. The result was our first two published adventures; Rahasia (which, in Indonesian, means ‘secret’) which was followed by Pharaoh. I did the cover art and maps by hand with a technical pen and plastic templates, drawing on my Junior High School drafting skills. I also used that same pen to do the interior artwork on Rahasia although the artwork for Pharaoh we actually commissioned from a high school student named, as I recall, Josh Pagel. The text itself was typed on an IBM Selectric typewriter my father had loaned to us and was ‘hand-justified.’ Today, of course, you simply hit the ‘justify’ setting on your word processor to get the left and right columns even. But remember, this was 1978 and home computers were a very new and expensive idea. So to get the columns even, I would type out the text with certain narrow margins then count the spaces at the end of each line, insert slash marks between the words equal to the number of spaces at the end, then retype the text while putting in the additional spaces manually to make the margins even. The text was then laid out, again by hand, by cutting these pieces of text into strips and gluing them to layout pages with rubber cement. (Again, techniques from my Junior High Journalism class.) Headline ‘typesetting’ was accomplished using rub on lettering — or my own hand when necessary. As for Rahasia: it was eventually published by the RPGA as a module with a companion adventure called Black Opal Eye — this second design coming straight out of the first level of my first campaign game design. Pharaoh became the first part of the famous “I” series which included all of the Desert of Desolation modules and, of course Ravenloft. Interestingly, with The Lyceum now being set for release as part of the new Dragonlance War of the Lance 20th anniversary game book, I can’t think of a single adventure game design of mine or my wife that hasn’t sold and been published somewhere. Unscribe: Thank God for modern publishing programs on computers these days. The attention to detail of your DayStar West efforts is impeccable. This is interesting to hear about the art commissioning. I was getting worried that you were not only an all star writer and cartographer, but a visual artist as well! Your DayStar West items have a sense of architecture about them. In fact, I think you mention this in their introductions. Everything about them is very detailed and structured. This quality even comes out within the Dragonlance series. I remember being floored by how good the cartography was for DL which was far and away better than previous TSR mapping systems. I assume Tracy didn’t actually do the cartography for DL but I would bet he did creative directing for them. Did you actually study Architecture by chance in those days before TSR? 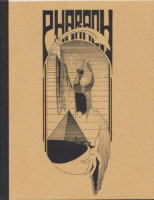 Was Vampyr and Eye of the Dragon published to the extent that Pharaoh and Rahasia were (covers, art, etc.)? I know covers were certainly made for Eye of the Dragon. Please excuse my ignorance, but I do not know of the origins of The Lyceum or what it is. Could someone explain this to me further? As for The Lyceum; it was an adventure that I wrote and put on my website at one point. It was set in the Dragonlance world. And thank you for kind comments on my sense of architecture! I’ve always been fascinated by the subject although I’ve never had any formal training in the art. Unscribe: What parts of Eye of the Dragon would you say rolled into what became the Dragonlance saga? Characters, villains, plotlines, settings? Tracy Hickman: Eye of the Dragon, as an actual text, never got much past the preliminary stages. I had some sketches of the floor plan maps and some notes (not to mention those covers) but that was about all. There really wasn’t enough there to claim any direct relationship to such specifics as characters or setting … so much as it was about general concepts of dragons being used as beasts of war. We borrowed from Eye of the Dragon ideas and the ideas of my campaign world for the foundations of Dragonlance. Tracy Hickman: I wouldn’t know … I’ve never seen it (and continue to avoid doing so at all costs). The worst that can happen is that skeletal hands will reach up out of the ground and try to grab our ankles and drag us under the dirt, where we’ll die in terrible agony.